Today Paper Smooches releases their newest set called "Summer Groves," and I was asked to help promote this sweet set! This is the eighth stamp set from their "Kismet collection". What I love about this set is the variety of large and small stamps, so you can make all sorts of fun projects with them. I'm so excited to share a couple of cards that I made with this totally ADORABLE set using both the large and small images. I like stamping with paint! It's the perfect summer combo! I thought that stamping the tree with paint would be a fun idea! So, I turned the stamp upside down, added paint and then stamped on cardstock. Afterwards, I stamped the tree lines over the paint to add details. 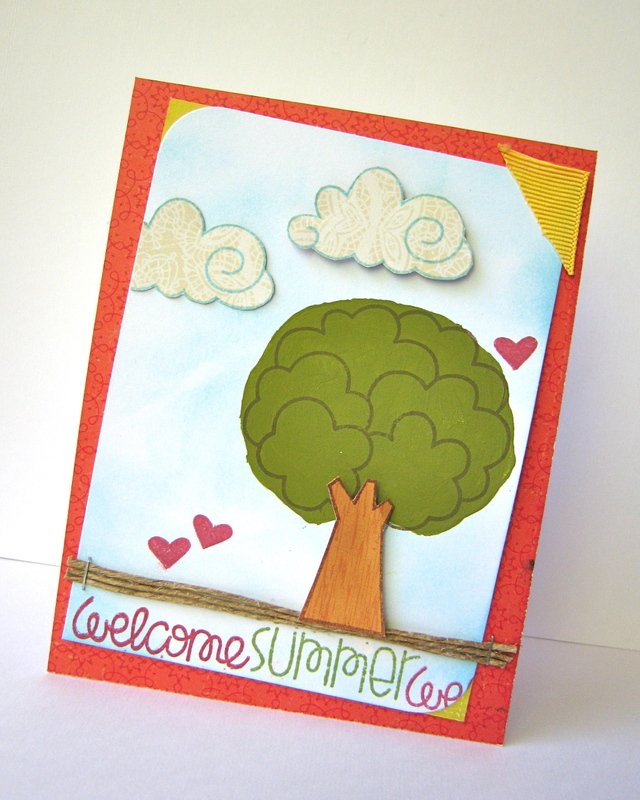 I then stamped the trunk on patterned paper and fussy cut the tree trunk, popping it up with foam tape. The sky was sponged with some blue ink and I added some natural twine for texture. This card uses the stamping with paint technique as well, but with the "Summer Grooves"
I painted the back of each of the little floral stamps and then stamped over the dry image with dye ink. 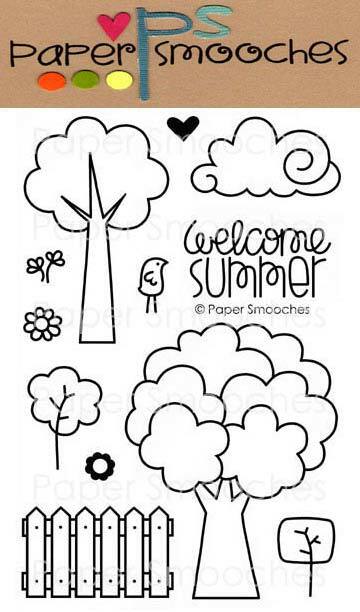 I have one "Summer Groves" stamp set to give away to one lucky person! You have until midnight on June 17th to leave a comment. However, I will not be able to post the winner until I return from vacation on Thursday, June 21st so make sure to check back then!! your PS cards are so adorable...i love this new set...thanks for sharing..
Super cute cards!! Love this new set.....thanks for the chance to win. This is so cute! I love the idea that you don't have to fussy cut to pieces. Great cards! Just got to love that tree! Your cards are adorable, thank you for sharing them. Ohhh, I love your second card! So bright and fun! Love your cards! Very clever...have an amazing vacation! Such a sweet, happy set. Enjoy your vacation! Love how you used the paint techniques on your cards, looks really cool, I really like this new stamp set, thanks for the chance to win it!!!! These stamps are as adorable as can be, just as your cards are!!! I definitely want a set! Thanks for the chance to win! How clever to use the small stamps like that! Love both your cards. Thanks for the chance to win! thanks for the contest! I love your tree using paint--what a clever idea! These are really cute, loving those trees. Sweet set of cards!Love the idea of painting on the card. This is such a lovely card!! I am in LOVE with this stamp set! I love your PS Kismet cards! I would be thrilled to win this set! Thanks for offering it! Thanks for the cute cards. You showed the versatility of this new set. Thanks for the giveaway too. AWESOME job Emily!! love them!! These are pretty! 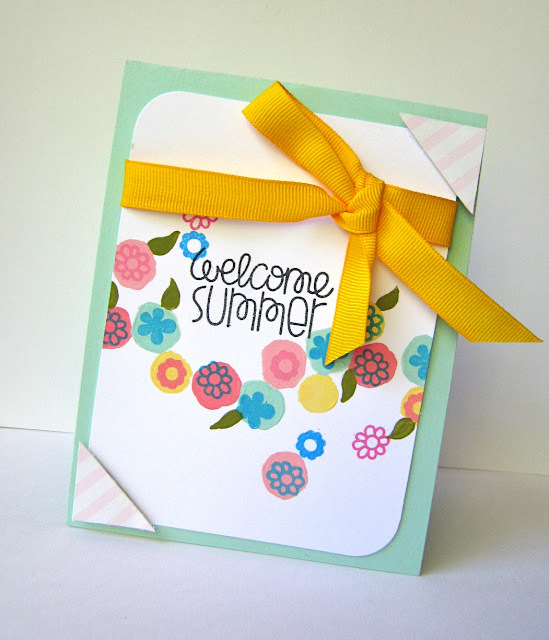 Love the loose summery style in your cards! Looks great! cute cards. Love the use of paint. Your tree is loverly. Thanks for the chance to win. Have a good vacation! AMAZING cards! LOVE your paint stamping! LOVE your second card--super fun colors! LOVE that ribbon! YOU ROCK:) LOOOOOOOVE! Totally sweet cards! Love the second one soooo much! CUTE cards! 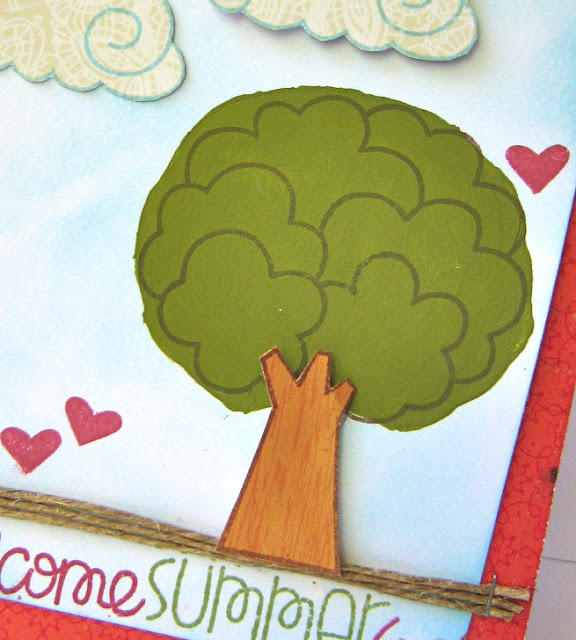 I really like the way you "included" the tree "puffs" inside of the larger cut shape and dotting over the smaller shapes on the other card is a great idea! Emily, thanks for offering blog candy! My friend Savannah sent me. ;) I don't have any Paper Smooches...would love to give them a try! Cute idea with the paint. Thanks for the chance to win! Oh so cute! Love both of your cards and the painting technique that you have used. I'll have to remember that one. ; ) Thanks for a chance to win. This set looks like it would get lots of mileage and be used for so many things. Gotta love that!! over the top cuteness! luv this set! Such an adorable set!! Your cards are so cute! Sooo super creative to stamp with paint! Love those cards! Especially love the one using the smaller images. How cute. oh the cards are too cute, I especially love the Welcome Summer one with those lovely flowers! Great job with the stamps! Such pretty fun cards! What a cute set and your cards show it off perfectly! Love the new stamp. Your cards are adorable. Thank you for sharing with us. Your cards are so cute. Would love to win this stamp set. Thanks for the opportunity and inspiration. 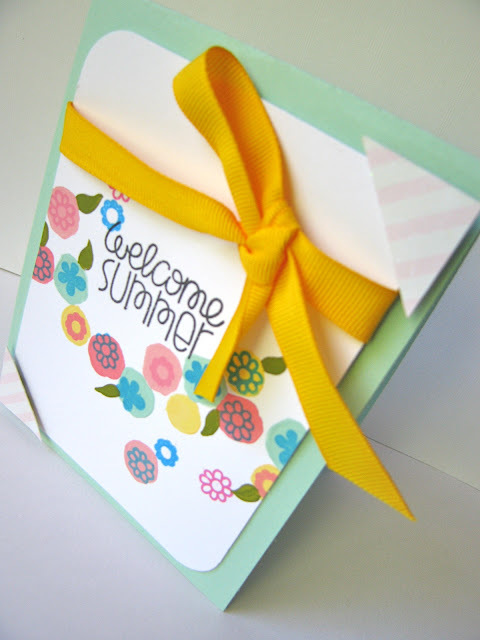 Adorable cards...love how you used the back of the stamp and paint. this stamp set is so cute! i liked the paint effect. so perfect for summer. thanks for the chance to win. Very cute cards--I like the paint technique you used. SUPER CUTE! I would LOVE to have this new set! 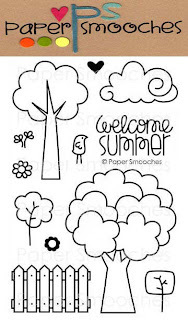 You did a great job with the "Summer Groves" stamp set. I like your paint and stamp technique. Have a great vacation, we'll all be waiting anxiously for your return. Love the paint idea looks awesome! Thanks for the chance to win and enjoy your vacation. Love what you did with the clouds. Everything looks so soft and happy! Thanks! Another great stamp set from PS - love your cards and what you have done with the stamps. :) Have a great time away! Both cards showcase this set really well! I love the sentiment in the midst of all the flowers in the second and the way you stapled on the twine in the first! That stamp set is so fantastic. Would love to win the set. Love the stamping with paint on the backside of the stamps. Great effect. Yay, so fun to see you using Paper Smooches, Emily! I always love how you paint with the backs of the stamps. I need to try that!